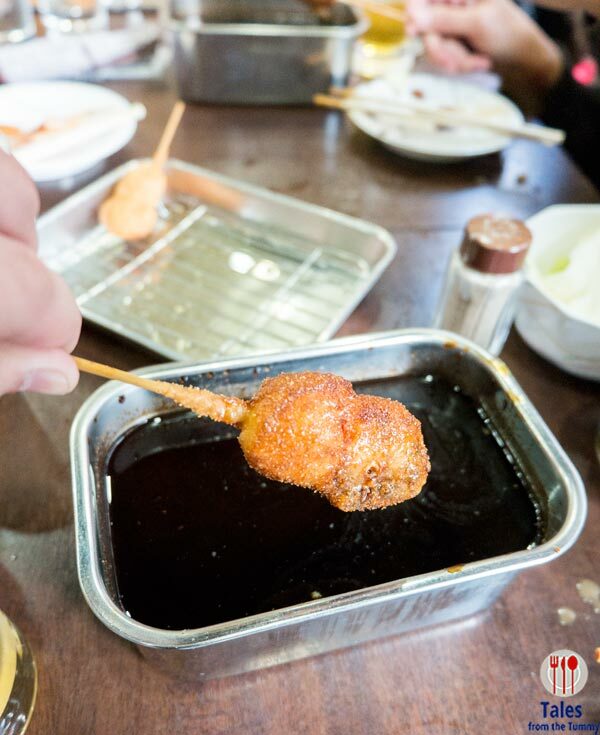 Kushikatsu, battered and deep fried meat, veggies or seafood on a skewer, was on my list for must try things in Osaka but I was still apprehensive because I perceived it to be oily. 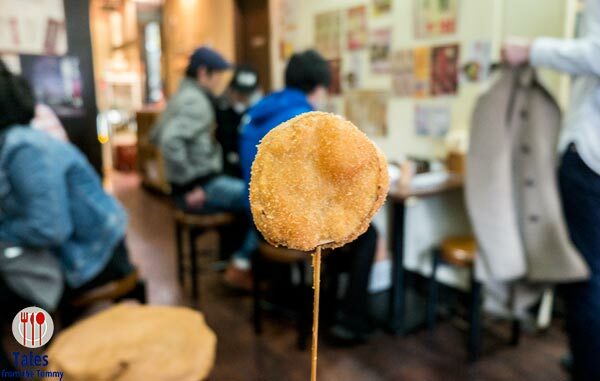 Kushikatsu is . 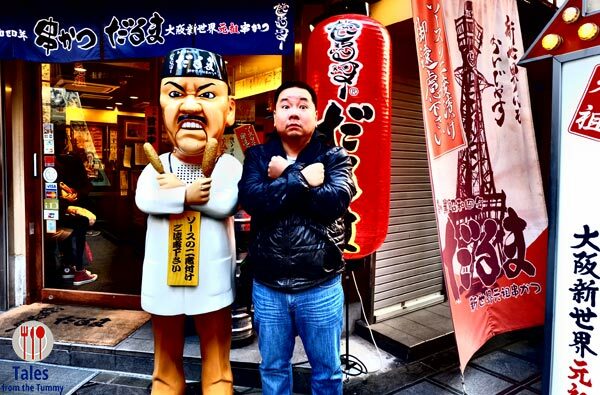 The kushikatsu restaurant we decided to try was Daruma Kushikatsu Restaurant. 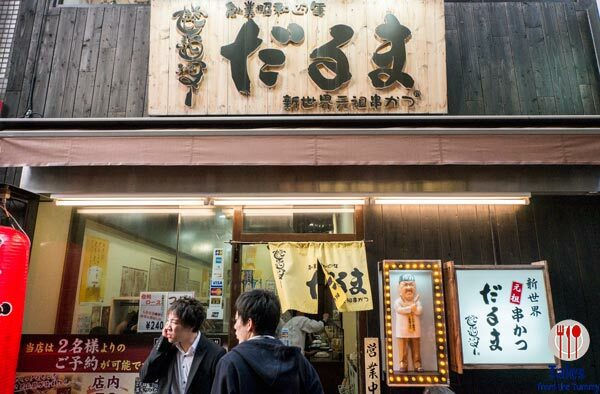 The branch of Daruma we got to visit was on a side street near the Dotonbori branch of Hanamaruken. There’s a bigger and more modern one along Shinsaibashi and many more scattered around Osaka but somehow we ended up in this one. 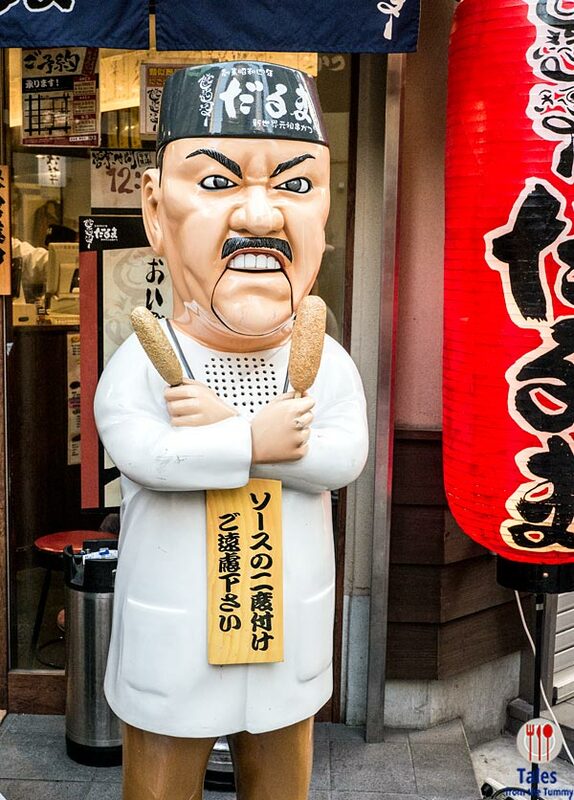 You can’t miss Daruma because of their chef/mascot in front of the store holding two sticks of kushikatsu’s. The branch we visited had a tiny one encased in a glass case so I posed in the branch below Yakiniku M (will blog about this soon). The branch was a bit on the old side but it added to the charm. The first floor was packed so we headed to the 2nd floor where a couple of the tables were already having a couple of drinks evidenced by the reddish cheeks of the patrons. 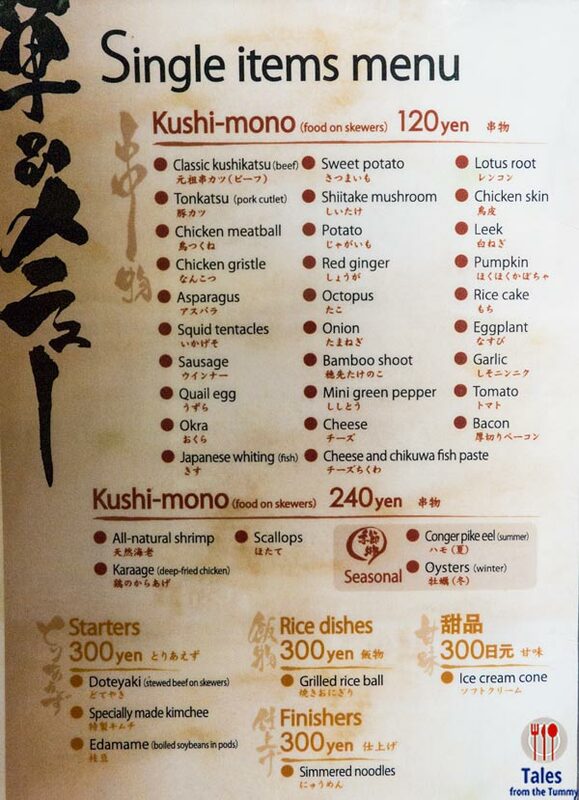 Here’s the menu for you to have an idea of the items they serve. We were not sure if Lauren would like it so we got the Shinsekai Set (¥2,200 or about P815) to share between 3 people. 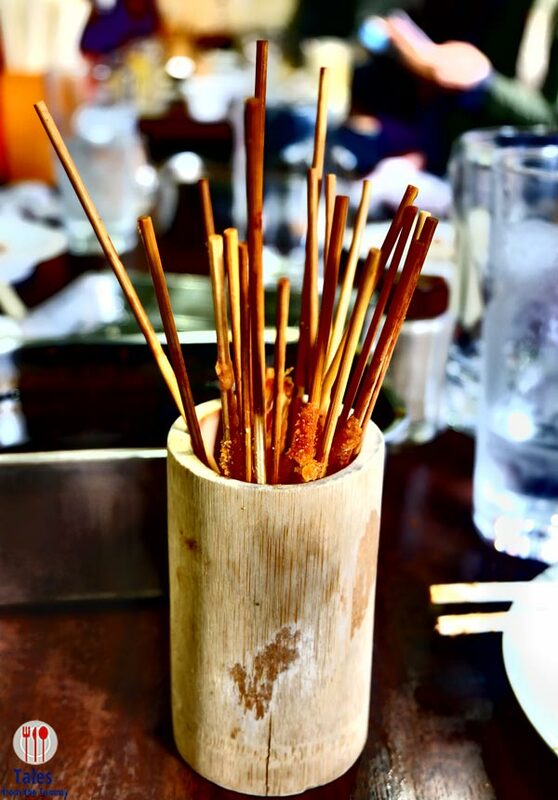 If Lauren liked it, we’ll just order more ala carte sticks. Our set with a choice of Doteyaki (beef tendon with radish), kimchi or edamame. 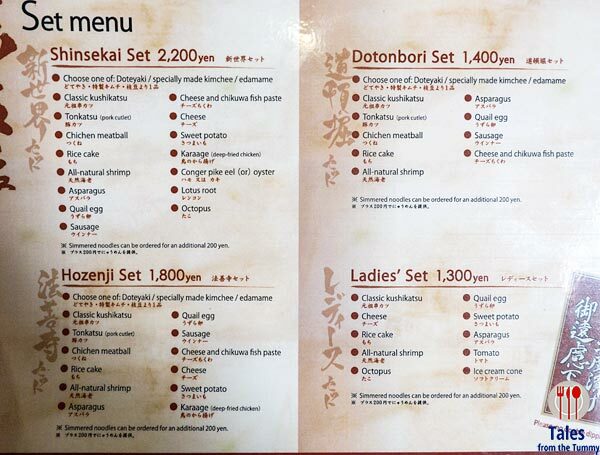 We picked the doteyaki since it was the most interesting among the choices and it turned out to be delicious. 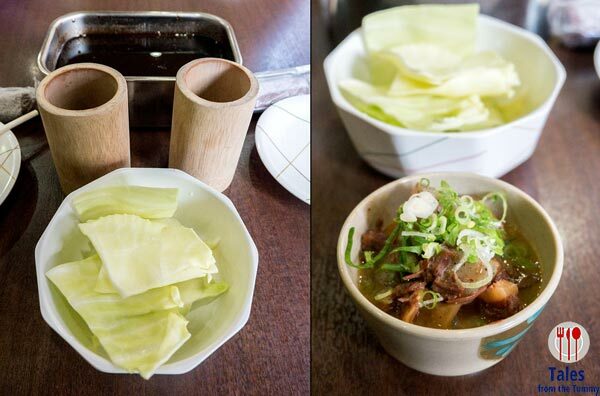 A platter of cabbage is also served, as a crunchy accompaniment to the kushikatsus. You can ask for more of the cabbage once you consume the all, best dipped into the sauce, a lighter tonkatsu sauce that has a bit of oyster sauce taste. There is a sauce container on every table and it is forbidden to “double dip”. 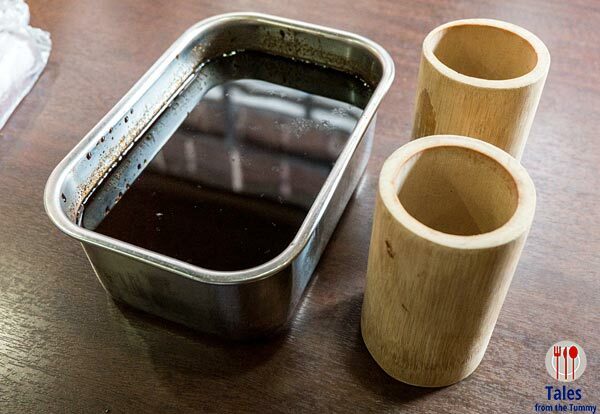 Bamboo container are also provided to put your finished sticks. 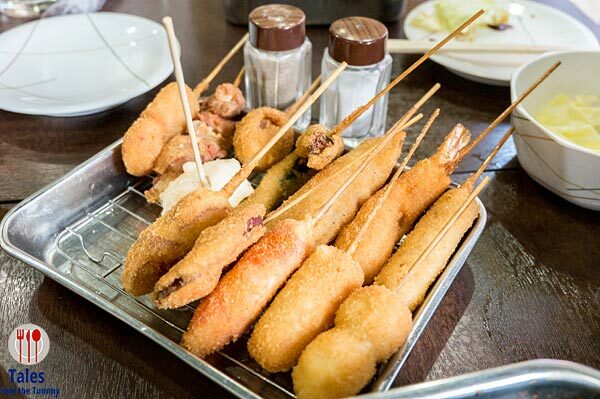 Here’s our platter of 15 sticks. Lauren tried one and demanded we order more especially the special beef skewer they had listed on a flyer stuck on the wall. Remember to dip only once into the sauce. 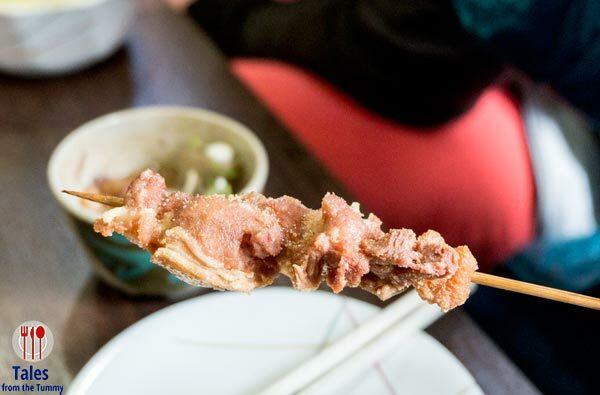 The skewers were lightly fried with not a trace of oil, so chomp away. 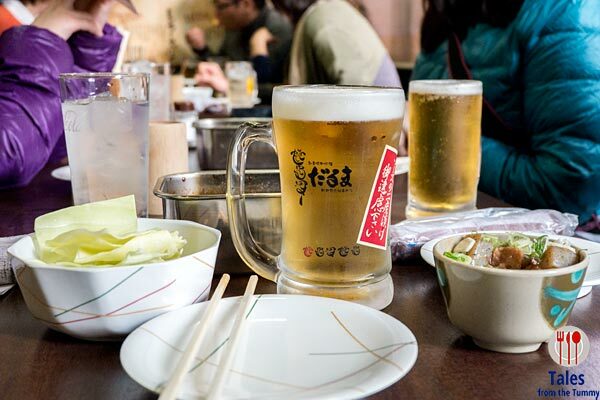 Best thing to drink with kushikatsu is Draft Beer “beeru” (¥530 or about P197). 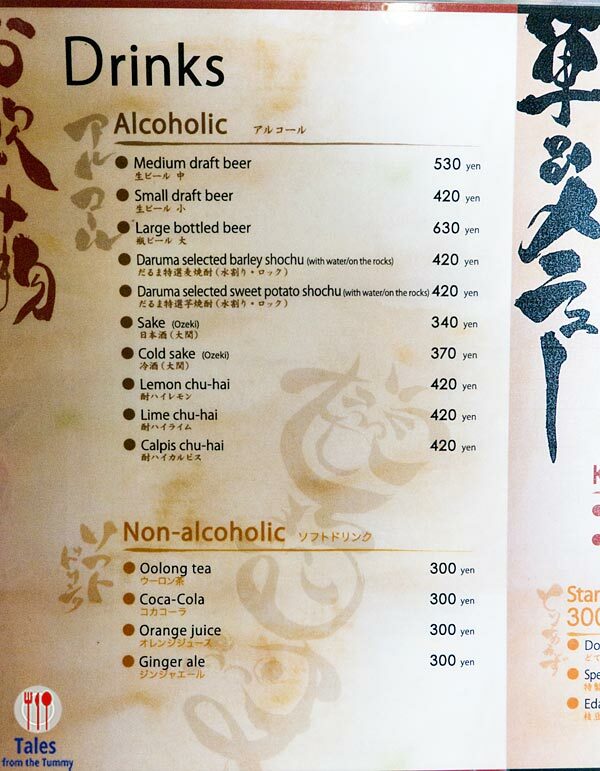 The beer is a bit on the expensive side but really matches a lot of food in Osaka. Here’s are the point remnants of our meal. Off we go to walk it off and eat some more food along the way. 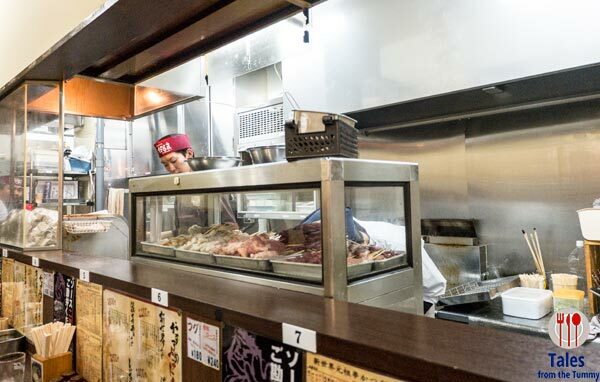 We really loved the atmosphere at Daruma, it had the izakaya (drinking place) feel to it. I’ve seen other more modern branches that have automated order taking gadgets on every table. Which ever branch you visit, I guarantee the food will not disappoint.